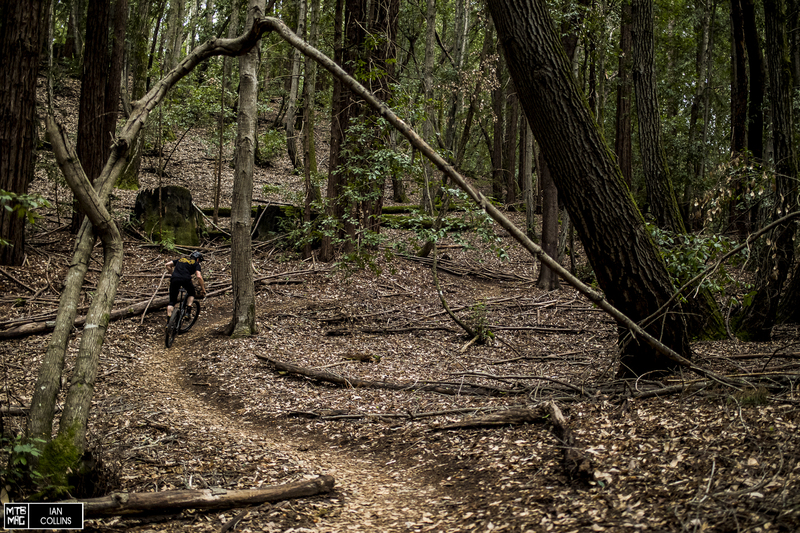 The birth of the new Stumpjumper meant the cannibalization of the Camber lineup altogether. After all, it was a bike that looked increasingly timid in a sea of new, aggressive short travel bikes from mid-sized boutique brands who are able to react to the market faster than the big dogs. Anyhow, I was happy to see Specialized replace the Camber with the Stumpjumper “ST”. 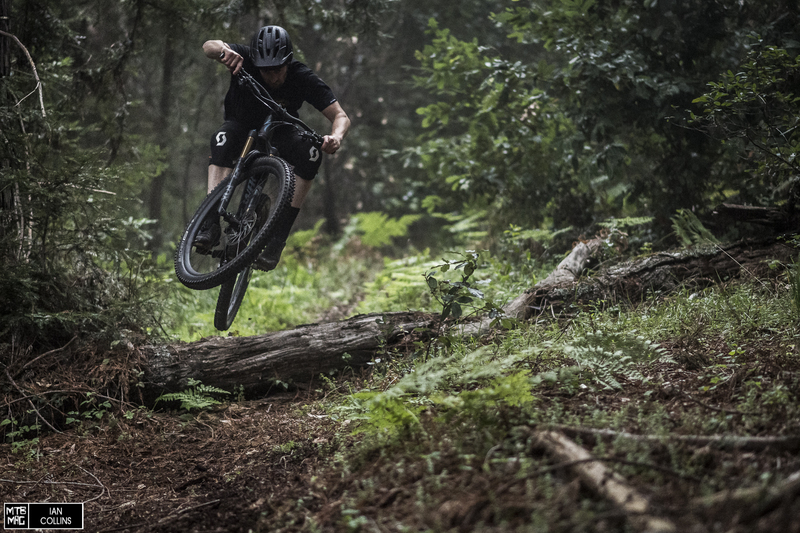 Within the updated lineup, there are now Standard and Short Travel versions of the Stumpjumper available with both 27.5″ and 29″ wheels. This makes the Stumpy family both large and diverse, but they’re all cut from the same cloth – in fact, the standard and ST versions use the same front and rear triangles within a given wheel size. There’s also the “EVO” version, but that’s an entirely different animal altogether, which we’ll be exploring in the future. 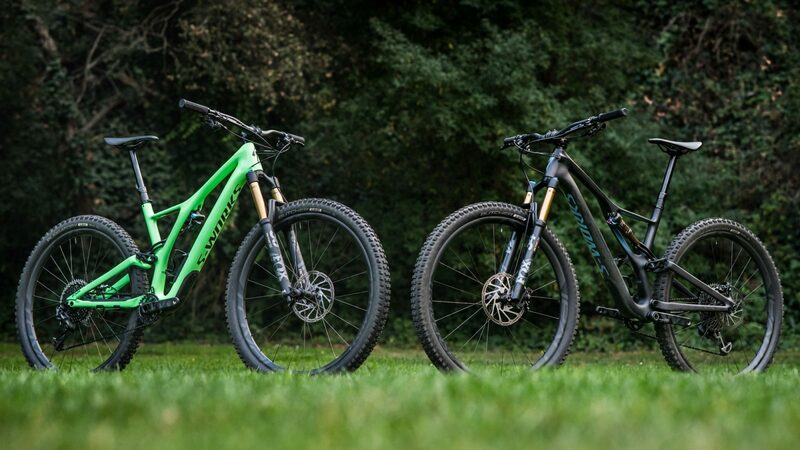 As far as this article is concerned, I tested the “snappy and nimble” Stumpjumper ST and the “fast and planted” Stumpjumper, for a back-to-back comparison aboard flagship S-Works models on 29″ wheels. Disclaimer: this isn’t meant to be read as an elitist “which $9,500+ bike is better?” puff piece, but rather, I aim to look past price points and focus on each platform’s general pedigree. After all, Specialized offers a broad spectrum of pricing, so you can get in where you fit in. Compared to the last iterations, a very welcome, longer reach is seen throughout the entire line. The increase varies with size and model, but it’s up between 10 – 20mm on average, while chainstay figure remains identical for both new 29″ models at 437mm. The head tube angles are around 1º slacker for more confident handling at speed and on steep descents, while the seat tube angles got steeper for improved positioning on the climbs. Not fully geometry related, but still pertaining to handling and weight distribution, the handlebars got wider (from 750 to 780mm), and dropper posts see more travel (from 125 to 160mm), staying with the times, increasing the bike’s capability and boosting its confidence. As mentioned prior, this article is less about nit picking spec and parts, but as a general run down the models tested feature SRAM XX1 Eagle 12-speed drivetrains and Guide RSC brakes. Both have proven to be excellent, and more affordable versions of the same platforms are offered at lower price points on down the line. The same can be said for the Roval wheels which, in our experience have been excellent at every given pricepoint – and we have ridden them thoroughly from entry to flagship levels. When it comes to suspension, at the S-Works level, Fox is spec’d front and rear. Also note that the Stumpy ST is spec’d with 2.3″ wide tires and the standard Stumpy sees a brawnier 2.6″ wide set. 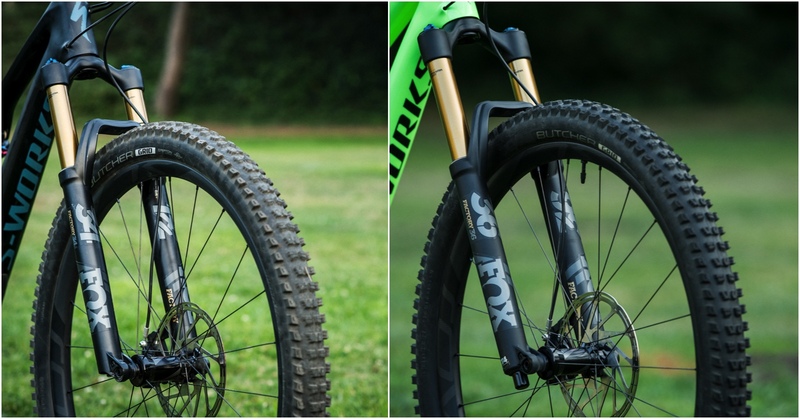 The Stumpjumper ST features a Fox 34 (left), and the standard Stumpjumper sees the much beefier 36. Those numbers designate stanchion size, which correlate directly with handling, stiffness and precision. 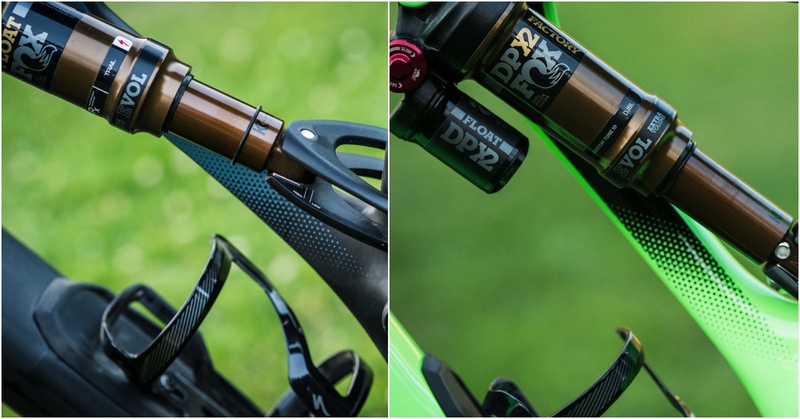 On RockShox spec’d Stumpys, like the “Expert”, ST models see a Pike (35mm stanchion). 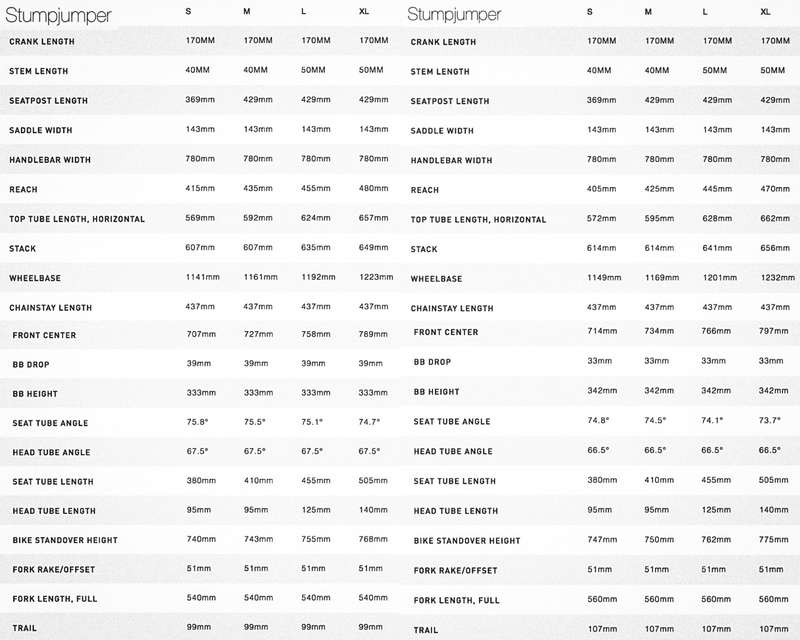 All 29″ models have 51mm of offset. Much like the front end, the models with more travel see a longer, more capable rear shock with a piggy back. The ST has a Float DPS at 190×42.5mm, and the standard Stumpy has a Float DPX2 at 210x50mm. All shocks in the lineup get custom Specialized “Rx trail” tunes as opposed to an A,B,C style stack from a tuning bank. Regarding where the bikes fit in on the Linear to Progressive continuum, the standard Stumpy sits at 16.5% progression, and the ST comes in at a virtually indistinguishable 16.3%. I wouldn’t consider the Stumpjumper(s) to be super progressive, nor do they fall flat. They’re pretty linear throughout the travel, but with the help of an air shock, they resist bottoming fairly well. In order to use the same front and rear triangles for two bikes with a 30mm difference in travel, some part of the frame obviously has to vary. There are two different yokes to drive the rear shock. The ST is on the left pictured above, and sits further forward to make up for the shorter shock. Note: according to Specialized: “No more proprietary BS!” Gone is the “Manchu” yoke; the new yoke uses a really smart cam inside of a standard shock eyelet to adjust between high/steep and low/slack with a single 5mm allen key. The first bike that I rode was the Stumpjumper ST. I spent a couple of months on it before jumping over to the other bike. Right out of the gate I was blown away – it is far and away the best handling mountain bike I’ve ever ridden. Those are big words, and as mentioned prior, I am a sucker for short travel 29″ bikes, so take that for what its worth. The first bike that got me hooked was the first Evil Following, but that was a couple of years ago and while it was eye opening, it was by no means perfect. The Stumpjumper ST is far more agile, precise in its handling and has an absolutely insane amount of pop. A bonus, which applies to both Stumpies is the brilliant SWAT downtube storage system, which sees 20% more volume this year. Say goodbye to hydration pack swamp back. Other prop worthy points are the 200mm/180mm rotor combos across the line, the SWAT CC headlock/chaintool/multi tool, and a chainstay protector that keeps things real quiet via its brilliant design. Anyhow – getting back to the ride characteristics, the ST’s boosty nature is likely best attributed to its brilliant carbon layup, and not solely due to well crafted angles and smart suspension. Speaking of suspension, while it was well tuned, I do have a couple of small points of contention. First off – as the ST version is SO capable of swinging above its weight, personally I’d prefer to see it spec’d with a reservoir shock and a stouter 36 fork up front. The modest weight penalty would make it better equipped for longer, rougher descents and heavier abuse. It could be a fluke, but I did end up with a hair of bushing play in the 34 after just a couple of months. Fox doesn’t make a 36 at 130mm travel, and they probably don’t make the DPX2 in a smaller 190 X 42.5mm size, but my point is that the short-ish amount of travel doesn’t hold the bike back one bit. It begs for more, is an absolute blast to ride and the handling is just razor sharp – words can’t possibly convey how intuitive it is. I’ve never ridden any bike that treaded the fine line between arcing and drifting a turn so beautifully and confidently at such a wide range of speeds. Shifting gears and hopping onto the standard Stumpjumper, I found a bike that, due to its additional travel, was more capable on difficult, foreign terrain, although it came at the expense of some sprightliness. Don’t get me wrong, it still handled incredibly well and I appreciated the stiffer, calmer suspension bits. So far in my testing, I’ve had a general aversion to long travel 29″ bikes as I typically don’t feel like I’m “in it”, but rather sitting a bit high on the bike. Although 140mm is not “long travel” by any means, I did settle into the Stumpjumper very nicely. Thanks to a nudge from Sean Estes – the PR guy at Specialized – I rode both bikes with both tire sizes. For what it’s worth, I liked both bikes better with the opposite of what was spec’d for tires. Perhaps that was because with 2.6’s on the ST, it had more cush and confidence. 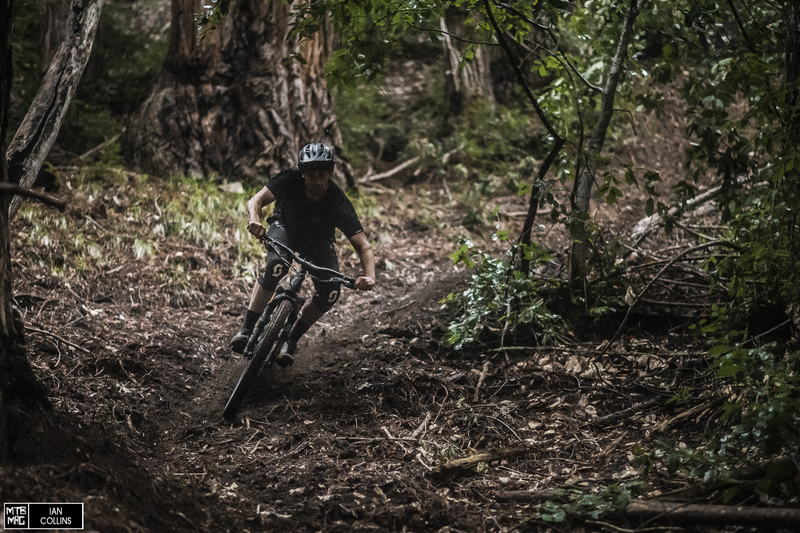 Conversely, on the standard Stumpy, with 2.3’s, the bike became a bit more nimble, and light on its feet, without feeling like it gave up much in terms of capability. The tire swap put less of a divide between the two models in terms of overall attitude. Now for the less exciting part. When it came to climbing, it’s not far from a wash between the two models. Body positioning on both bikes felt about the same – the seat tube angle isn’t crazy steep, but left me upright enough and at around 74-75º it’s up to par with modern figures, making it easy to shift your weight up front on the steeper bits. Speaking more from the kinematic side, FSR is good, although there are other bikes out there that are more neutral under power. DW-Link/Split Pivot bikes certainly come to mind…In any case, on long fire road grinds, the full lock out was appropriate on both bikes, and trail mode was ideal for rougher, more technical climbs. Weighing in at just over a pound less (26.8lbs vs. 28.0lbs) and having smaller tires, the ST model was a bit zippier uphill, but in the long run, both bikes climbed very well, leaving little to complain about. Compared to many other bikes in the short travel, aggressive 29″ category, the ST is a easier to get back up the hill and more well rounded. Now – if you only have room in your garage and/or wallet for one mountain bike – well, the standard Stumpjumper is about as do-it-all as it gets. It’s a highly capable, mid-travel bike with big wheels, wrapped in big-ish tires. It has limits, but it will get you down 90% of the riding you’ll encounter. Add in the brilliance of the SWAT downtube and there’s little to complain about as a “one and done” bike for the average ripper. What’s praise worthy between both models is that Specialized really stepped it up and made the bikes more aggressive and capable in every aspect. They absolutely nailed it with sizing, geo, suspension and specs. That said, they played their cards right and didn’t lose sight of what the Stumpy is all about – versatility. Having the “flip chip” makes it so that these bikes can be set up on the conservative side should you choose. In my review summaries, I always talk value. Since this is a comparative review of two flagship bikes, here’s my final word. If it were my money, without question, I’d buy the Expert ST model. For $5,500 USD, it has an excellent overall spec; it even boasts carbon fiber Roval wheels on DT hubs, which happen to have been treating me very well the last few months. On paper, it looks to be very tough to beat.